Defunding Obamacare, continuing resolution, government shutdown, the incompetence circus of the Obamacare launch. The Fall rollercoaster on the Hill has been quite something to watch, and also very instructive. We have learned just how spineless John Boehner, Mitch McConnell, Eric Cantor and the other Senate Republicans really are. We have learned that they will studiously ignore 70% of the American people who have been communicating their opposition to Obamacare through every means at their disposal. We have seen that they care only for their own power and money, and nothing for the constituents they represent. We have seen just how vicious they can become when that power, the Establishment status quo, is reminded that they do not rule the citizens, the sovereign American citizen grants them representative duties. And we take them away, too. Establishment Republicans can’t stand what Senator Ted Cruz did when he stood on the Senate floor and vigorously articulated the problems with Obamacare because it contrasted their own greed and cowardice so obviously. From its unconstitutionality, to the unfairness of exemptions and subsidies, to its negative impact on the economy and healthcare, and everyday Americans, Cruz made the conservative argument the whole Republican party should have been making. Imagine if the rest of his party had done the same! Imagine if they had spent as much time and energy supporting the man doing the right thing as they did attacking, undermining, and opposing him. Imagine too, if they had spent as much time and energy working to persuade Democrats to vote with them to defund what Max Baucus (D-MT), the author, called the law: “a train wreck.” Making the conservative case, it would hardly matter that the media is the Left’s propaganda machine. They wouldn’t be able to contain it. Cruz took the conservative message to the people, and many heard him. It was powerful, and the gutless Republicans hate that. While trashing the Tea Party (which is to say everyday conservative-leaning Americans), the GOP amoebas keep telling that same group to deliver them the majority and then they will fight to stop Obamacare. We all know that now that it’s in, it will be all but impossible to stop it. The near-impossible is hardly the specialty of today’s GOP. And what will they do when the inevitable argument comes that, yes, the whole thing is a catastrophe – the solution is a one-payer system? Will they fight to open us to a free market solution instead? No. They don’t want to stop Obamacare. They want to control it. Obamacare is a cancer that needs to be cut out before it can spread, and the House did its Constitutional duty by using the power of the purse to deny funding. The rest just showed us their utter cowardice and indifference to the will of the people and their own oath of office. They wrapped themselves with blame for the shutdown long before it happened in order to point the finger at the real conservatives in the party. But the real conservatives are not to blame for the shutdown any more than they’re responsible for Obamacare itself. They are the ones doing the right thing, and the ones doing the wrong thing despise it. Whatever the Boehners, McConnells, McCains and Jeb Bushes are saying, you can bet doing the opposite will put the country on the right track. Jeb says we need to step back and cool it, so what we really need to do is bring the heat vigorously and constantly. Remember that when they are telling you to cool it, they are saying cool the fight for liberty in the face of tyranny. Cool your jets on the fight against Obamacare, the newest form of slavery. HELL NO WE WON’T. 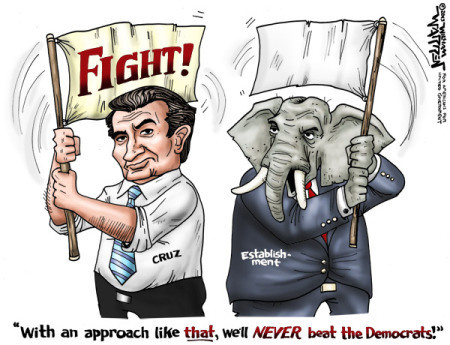 If you are a conservative and you’re not being attacked by liberals and squishy Republicans, you’re doing it wrong. Winston Churchill was called a warmonger, among many other slurs, for opposing Hitler, while Neville Chamberlain was given hero’s praise for appeasing him. Who would you rather have been? Who will you be today? So keep doing the work Establishment Republicans won’t do. Keep bringing the heat against them. Raise your voice. Write your ink dry. Call and email your reps and bug the hell out of them. They are accountable to YOU. And support people like Senators Cruz, Lee, and Rand Paul who are actually upholding their oath to defend the Constitution against all enemies foreign and domestic. They’re leaving it all on the field to preserve liberty for all of us. Thank them.